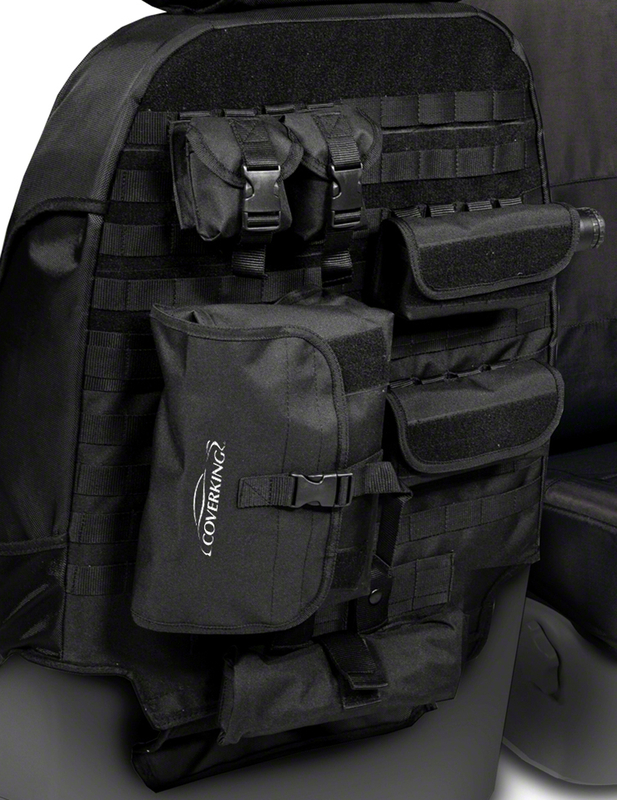 Anaheim, CA (April 18, 2012)—Off-roaders, hunters, fishermen, hikers, military, law enforcement or anyone looking for an outdoor adventure can now store the tools of their trade more efficiently for transport with Coverking’s new Tactical seat covers. Well-known for their custom car cover and vehicle accessory lines, Coverking has added a new twist by incorporating a military-style M.O.L.L.E. (Modular Lightweight Load-carrying Equipment) attachment system on the backs of their ultra-tough Ballistic nylon custom front seat covers for maximum storage capacity and versatility. This method of storage takes advantage of previously wasted space in the vehicle’s interior, while providing organization and instant accessibility to items such as maps, binoculars, tools, first-aid kits, ammunition, tow straps, and more. Additionally, the modularity of the system allows the six included storage pouches to easily be transferred to a M.O.L.L.E.-compatible backpack or vest (not supplied) for hand-carrying into any situation or off-road terrain. 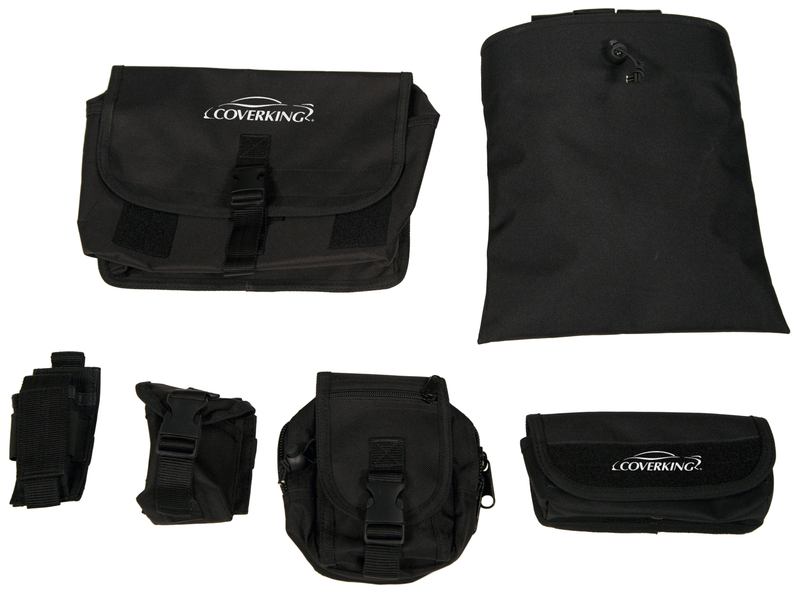 Coverking’s Tactical seat covers are make and model specific for an exact fit, which provides full coverage, leaving no seating surface unprotected. Their Cordura Ballistic nylon is abrasion-resistant, enabling it to endure the abuse of any outdoor adventure. 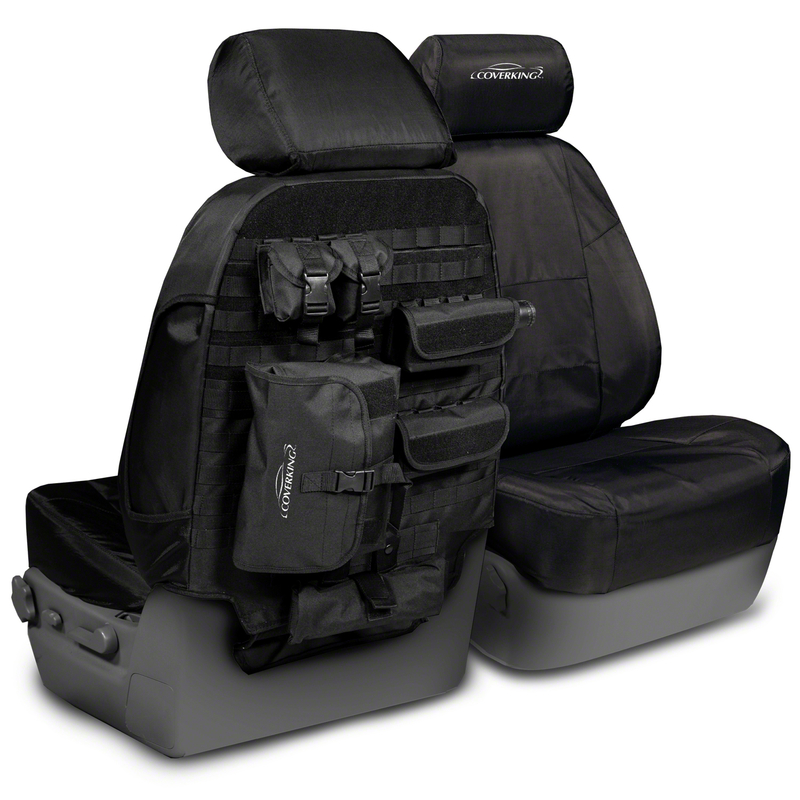 The Tactical seat covers are available in black, gray, or tan, and each set includes six M.O.L.L.E. pouches in varying sizes. Additional pouches are also available. All Coverking products are made in the USA and backed by a one-year warranty. Coverking manufactures custom covers in the USA for fine automobiles, motorcycles, and UTV’s, as well as seat covers, dash covers, floor mats, and cargo liners. Coverking was founded in 1986 by an aerospace engineer who brought sophisticated CAD/CAM systems, international quality certification, and a new process called “mass customization” to the automotive accessory industry. Pioneered by Coverking, mass customization is a technology for manufacturing a highly customized special order product in the shortest time possible. This technology allows Coverking to achieve a previously unattainable level of pattern quality and manufacturing efficiency. 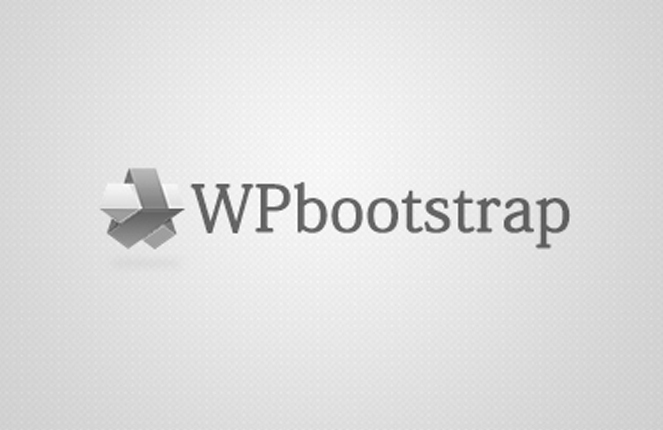 The result is a better fitting, higher quality cover made faster and at a lower cost than the competition. This has attracted leading automobile manufacturers, who rely on Coverking to manufacture private-label products for their vehicles. For more information visit www.coverking.com or call 1-800-COVERKING.